The Festival of Fantasy parade has many great floats, but the best has to be Dragon Maleficent. 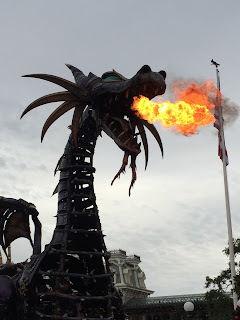 This amazing "beast" is huge, and it actually breathes fire as it makes its way through the Magic Kingdom. I was able to get this shot yesterday, while enjoying the parade in the area in front of the Harmony Barber Shop.